John Adams is a 2008 American television miniseries chronicling most of U.S. President John Adams’ political life and his role in the founding of the United States. Paul Giamatti portrays John Adams. 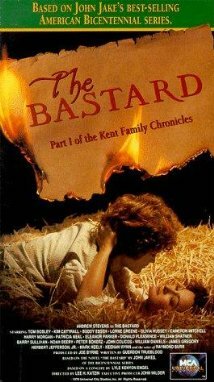 The miniseries was directed by Tom Hooper. Kirk Ellis wrote the screenplay based on the book John Adams by David McCullough. 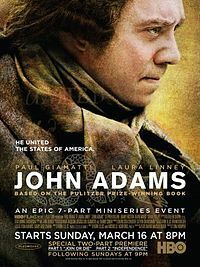 The biopic of John Adams and the story of the first fifty years of the United States was broadcast in seven parts by HBO between March 16 and April 20, 2008. John Adams received widespread critical acclaim, and many prestigious awards. The show won four Golden Globe awards and thirteen Emmy awards, more than any other miniseries in history. The first episode opens with a cold winter in Boston on the night of the Boston Massacre. 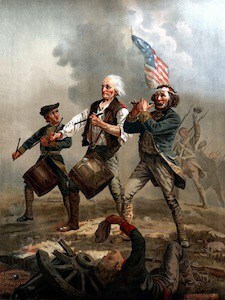 It portrays John Adams arriving at the scene following the gunshots from British soldiers firing upon a mob of Boston citizens. Adams, a respected lawyer in his mid-30s known for his belief in law and justice, is therefore summoned by the accused Redcoats. Their commander, Captain Thomas Preston asks him to defend them in court. Reluctant at first, he agrees despite knowing this will antagonize his neighbors and friends. Adams is depicted to have taken the case because he believed everyone deserves a fair trial and he wanted to uphold the standard of justice. Adams’ cousin Samuel Adams is one of the main colonists opposed to the actions of the British government. He is one of the executive members of the Sons of Liberty, an anti-British group of agitators. Adams is depicted as a studious man doing his best to defend his clients. The show also illustrates Adams’ appreciation and respect for his wife, Abigail. In one scene, Adams is shown having his wife proofread his summation as he takes her suggestions. After many sessions of court, the jury returns verdicts of not guilty of murder for each defendant. The episode also illustrates the growing tensions over the Coercive Acts (“Intolerable Acts”), and Adams’ election to the First Continental Congress. The second episode covers the disputes among the members of the Second Continental Congress towards declaring independence from Great Britain as well as the final drafting of the Declaration of Independence. At the continental congresses Adams is depicted as the lead advocate for independence. He is in the vanguard in establishing that there is no other option than to break off and declare independence. He is also instrumental in the selection of then-Colonel George Washington as the new head of the Continental Army. However, in his zeal for immediate action, he manages to alienate many of the other founding fathers, going so far as to insult a peace-loving Quaker member of the Continental Congress, implying that the man suffers from a religiously based moral cowardice, making him a “snake on his belly”. Later, Benjamin Franklin quietly chastens Adams, saying, “It is perfectly acceptable to insult a man in private and he may even thank you for it afterwards but when you do so publicly, it tends to make them think you are serious.” This points out Adams’ primary flaw: his bluntness and lack of gentility toward his political opponents, one that would make him many enemies and which would eventually plague his political career. It would also, eventually, contribute to historians’ disregard for his many achievements. The episode also shows how Abigail innovatively copes with issues at home as her husband was away much of the time participating in the Continental Congress. She employs the use of then pioneer efforts in the field of preventative medicine and vaccination against smallpox for herself and the children. 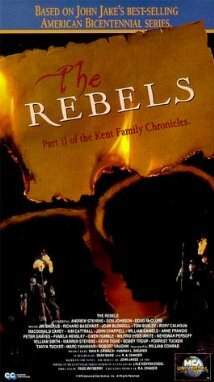 John Paul Jones is a 1959 biographical epic film about John Paul Jones. The film was made by Samuel Bronston Productions and released by Warner Bros. It was directed by John Farrow and produced by Samuel Bronston from a screenplay by John Farrow, Ben Hecht, Jesse Lasky Jr. from the story Nor’wester by Clements Ripley. The music score was by Max Steiner, the cinematography by Michel Kelber. The film starred Robert Stack in the title role, Marisa Pavan, Charles Coburn, Macdonald Carey, Jean-Pierre Aumont, David Farrar, Peter Cushing, Basil Sydney, Thomas Gomez and Mia Farrow in her film debut. Bette Davis made a cameo appearance as Empress Catherine the Great. The film begins with a United States Navy officer, telling sailors the story of John Paul Jones. By age 17, John Paul, a native of Scotland, is an experienced ship’s navigator. In 1773, nine years later, he is master of a ship in the West Indies, but after an incident that results in the governor of Tobago advising him to leave, John Paul adds the surname Jones and goes to visit a brother who lives in Fredericksburg, Virginia. The brother has recently died. Jones hires his attorney, Patrick Henry, to assist in business matters. He also takes a romantic interest in Henry’s sweetheart, Dorothea Danders. After serving as second-in-command of a battleship in the Bahamas, his adopted countrymen sign the Declaration of Independence. Jones gets his first command, sets sail toward Newfoundland and seizes 18 enemy ships, sending their supplies to American general George Washington. Washington sends the young officer to France, where he is appreciated for heroic feats at sea. Benjamin Franklin then urges Jones to take a frigate and invade the British Isles. A new vessel is built for him at the suggestion of Marie Antoinette, and the only condition of his majesty King Louis XVI is that Jones’ ship fly under an American flag. Jones’ successes ultimately lead him to Russia in 1790 at the behest of the empress, Catherine the Great. He returns to Paris ill.
A dying Jones, begins to dictate to Aimee, the type man and training to be given a future United States Navy officer. The final scenes showing the present day (1959) Midshipmen of the United States Naval Academy at Annapolis, Maryland. Admiral John Paul Jones gains acclaim as one of the most brave and daring naval figures of his time and in the United States Navy of all time. John Paul Jones, bassist for English rock band Led Zeppelin, took this stage name at the suggestion of a friend, Andrew Loog Oldham, who had seen the film’s poster (his birth name was John Baldwin).